Ken was born in Lansing, Michigan, but has called Urbana home for more than 30 years. 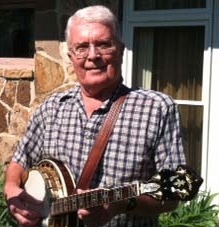 He has been playing bluegrass-style banjo for 45 years. Before joining the locally based Prairie Dogs band some 12 years ago, Ken played with the Nonesuch Mountain String Band, the High Cross Road band, and Hickory Wind. He is enjoying the life of a retired U of I Veterinary Medicine professor. Ken is retired from teaching at C4A too, but stays in touch and is always ready to lend his experience to our other teachers.